Thanks for coming back to read more about the adventures of aydat (unit) Gurim! The unofficial theme of Thursday and Friday was Maalot and Gurim peulot (activities), or ‘MaGuPeu’, as it is affectionately called. On Thursday, the Gurim banot (girls) joined their Maalot buddies for a wonderful hike up Saddleback ‘Mountain’. Saddleback is a trail a few minutes from camp that gently rises over slow-moving creeks. The trail is flanked by lush green flora, where many creatures native to New Hampshire find their homes. Of course, Gurim and Maalot fit right in with the scenery and had a blast getting to know each other better during the hike. That night, the madrichim (counselors) of Gurim and Maalot played hide and seek with the chanichim (campers). 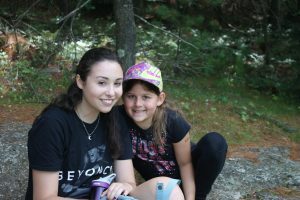 Counselors found hiding places around camp and, together with their Maalot buddies, Gurim searched for the madrichim. Everyone had a fantastic time. On Friday morning, the banim (boys) also hiked Saddleback with their Maalot buddies. 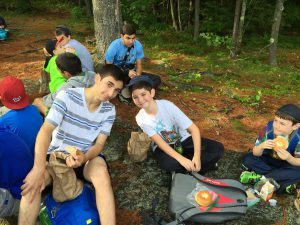 At the top of the mountain, the boys had an Iyun Tefillah (discussion of prayer) over a breakfast of bagels and cream cheese, where they discussed what Shabbat means to them and how they celebrate it at home versus at camp. After a restful and holy Yom Shabbat (Shabbat day), Yom Rishon (Sunday) came with a sudden blast of heat. On one the hottest days of the kayitz (summer) so far, the chanichim enjoyed a fabulous Yom Yisrael (Israel Day) run by the Israeli mishlachat (delegation), two of which, Adi and Saar, are Gurim madrichim. 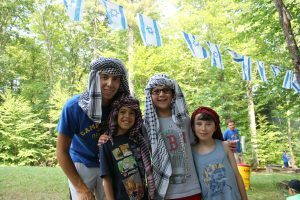 They learned about the many faces of Israel while making pita, participating in basic army training for the IDF, playing memory games, and taking a ‘tour’ of Israel on a hayride. At night, the mishlachat presented a tekes (ceremony) that summed up the entire day. Then Gurim rocked out to some awesome rikudei am (Israeli dance) to end the evening. Now, as we enter the last week of the session, we begin to entertain the idea of leaving our wonderful camp to go home, but not before one last hurrah in the form of Zimriyah (our camp-wide song fest). We will spend the rest of the week (or until Thursday night, anyway) alternatively preparing for Zimriyah and enjoying the last few days in style with many fun activities. Be sure to wish everyone b’hatzlachah (good luck) on Zimriyah!